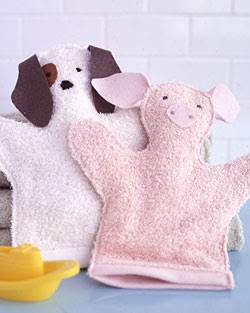 Tangled and True: wash cloth puppets. I went to a baby shower two nights ago for a girl I didn't know very well. I'm not in a position to spend a lot of money...and even driving 45 minutes away to get to a town with decent stores to come up with a nice gift around $10 would be spending money I didn't have for this situation. Today I was looking for a craft that Cole would enjoy (I'm trying hard to get creative with our activities together...and my time to myself) and found this on Martha Stewart. He would LOVE playing with those in the bathtub. AND...and they could make really cute gifts as a set of washcloths and some nice baby body wash. Hmmmm. How do you find all this great stuff? 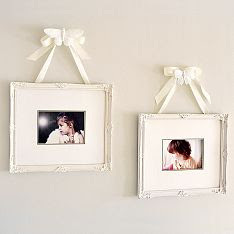 I love the frames - I need to copy this idea for Isobel's room (or perhaps the hallway). So cute. I would be thrilled to receive that at a baby shower. I also LOVE the washcloths. You've inspired me to be crafty and creative. And also to check out Martha's site more often. I am making these washcloths. Yes. I am. THOSE frames in the picture are from pottery barn kids. cute, right? but really easy to make! I really like making things as well...but I don't. I would love to start a project a week or something. My friend did a mirror with a ribbon hanging it on a wall and it looked really cute. We have bath puppets from PB and Avery really does like them. She doesn't seem to squirm as much when I'm trying to wash the dried and sticky food off her face.